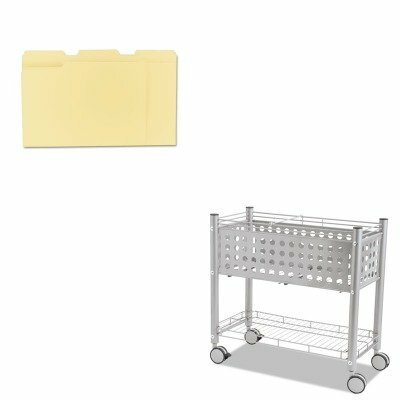 lt;stronggt;VRTVF52000lt;/stronggt;lt;BR/gt;Vertiflex Smartworx File Cartlt;BR/gt;For letter size hanging file folders. Sliding file rails adjust to hold legal size file folders. Bottom storage shelf removes easily to add Companion File Vertiflex Smartworx Companion File, sold separately. Durable steel and wire construction. Four twin-wheel casters, two locking. Color: Matte Gray Caster/Glide/Wheel: Four Twin-Wheel Casters 2 Locking.lt;BR/gt;lt;BR/gt;lt;stronggt;UNV12113lt;/stronggt;lt;BR/gt;Vertiflex Smartworx File Cartlt;BR/gt;Classic folder constructed to resist tearing. Bottom triple-scored for no-sag expansion. Undercut at tabs for increased indexing area. 11 pt. Manila stock. File Folder Type: Top Tab Size: Letter Folder Material: 11 pt. Manila Colors: Manila. If you have any questions about this product by Vertiflex, contact us by completing and submitting the form below. If you are looking for a specif part number, please include it with your message.